Afraid of Hearing God’s Voice? Why Do We Hate Tim Tebow? 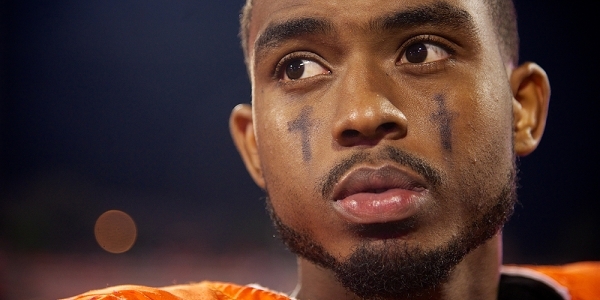 Darius Robinson, a cornerback at Clemson. Last season, Dabo Swinney, the head football coach at Clemson University, gathered his team on the practice field one day for an important announcement. “Someone is about to turn their life over to Christ,” he said. DeAndre Hopkins, a star wide receiver, stepped forward. A livestock trough had been placed near the 50-yard line and filled with water. Mr. Hopkins, still wearing his uniform and pads, climbed in. As several dozen teammates and coaches looked on, he was baptized. At Clemson, God is everywhere. The team’s chaplain leads a Bible study for coaches every Monday and Thursday. Another three times a week, the staff gathers for devotionals. Nearly every player shows up at a voluntary chapel service the night before each game. 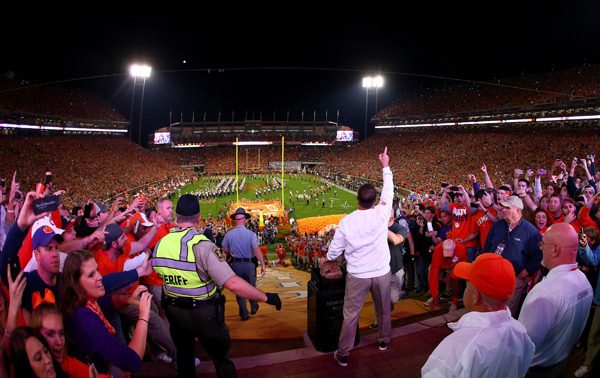 Christian influences are common in college football, but many people see Clemson as unique. Its approach plays well in this deeply religious state. But it raises questions about the appropriate place for God at a public university. Clemson officials insist they don’t force religion on players, and that they are open to people of all faiths. “I’ve had Muslims, Catholics—I’ve got two Mormons on this team right now,” says Mr. Swinney, a boyish-looking 44-year-old with a straight-talking Southern drawl. James F. Barker, the university’s president, says the football staff is careful to offer religious guidance only when players seek it. He compliments Mr. Swinney for building a program—10-1 ahead of this week’s clash with South Carolina—that has been successful on and off the field. But critics say the university should be more mindful about alienating players who do not share the prevailing belief. Along with James Trapp, the chaplain, he attends practices and stands on the sidelines during games. But while coaches look at players primarily through the lens of athletics, Mr. Davis says his responsibility is to see the whole person. In Clemson caps, Jeff Davis (left), director of player development, talks with James Trapp, the team chaplain. Both are former NFL players, and both are ministers. Many students pay heed to Mr. Davis’s advice, hanging out on the couch in his office, where a sign above the door says, “The House of Truth.” Along with lessons on manhood, he can school them on the Gospel. Several years ago, he helped start a church just off the campus. On some Sundays, as many as 20 Clemson players come listen to him preach. Next door to Mr. Davis’s office is Mr. Trapp, a former NFL defensive back who had a penchant for playing dirty. As a member of the Oakland Raiders, in the 1990s, he was often flagged for personal fouls, and once sprinted from the sidelines in street clothes to join an on-field fight. Late in his 12-year pro career, he found religion after attending a Bible study for players. 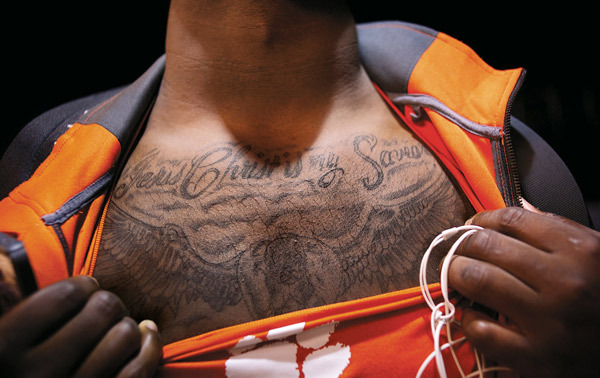 At Clemson, one of his first tasks was to learn the limits of sharing his faith. “I can’t just say, ‘Hey, man, here’s a Bible,'” he says. “I can say, ‘Hey, here’s some Bibles—do you want one? '” He keeps a stack of Bibles in his office, compliments of the Fellowship of Christian Athletes, a group whose aim is to spread the word of God through sports. Questions like that are meant to challenge students. But not everyone is comfortable with them. 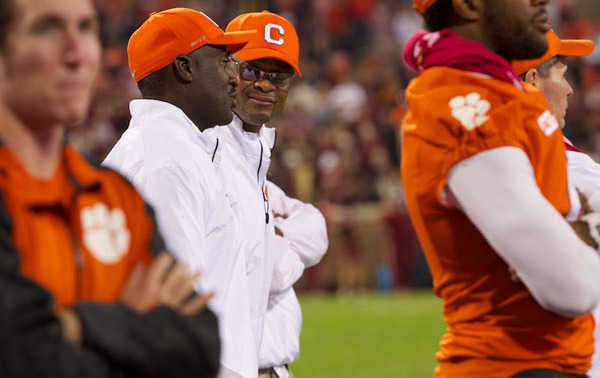 Last month, on the day Clemson played Florida State University, the two ministers manned the entrance to the players’ dining room as a parade of high-school recruits came shuffling through. It was the team’s biggest game of the year, and more than 150 prospects were in town. During introductions, a few players mumbled their names, and Mr. Trapp pounced. One player who passed through was a speedy cornerback from Alabama who had not previously shown interest in Clemson. When he walked in, Mr. Trapp stepped away from his greeting duties to follow him across the room. Like Mr. Trapp, who was once a world-class sprinter, this student has the potential to excel in two sports. The chaplain set his hands on the player’s shoulders and narrowed his focus. “Do you think you can beat my record?” Mr. Trapp challenged, ticking off accomplishments that include a spot on the 1992 Olympic team and a Super Bowl ring. “Because you can’t do that at every school,” he said, as some top programs won’t let students play more than one sport. In a few minutes of spirited chatter—with Mr. Trapp doing most of the talking—he emphasized the need to focus on more than football and described his own transition to life beyond the game. Coach Swinney also uses his background to connect with players. A native of Pelham, Ala., he was the first in his family to attend college, relying on Pell Grants and student loans. After landing a spot as a walk-on wide receiver at the University of Alabama, he earned three varsity letters and played on a national-championship team. He completed his undergraduate degree in business and added an M.B.A. while working as a graduate assistant on the team. In his five years atop Clemson’s program, the team’s graduation-success rate has climbed 10 percentage points, to nearly 80 percent. Its academic-progress rate, which measures real-time progress toward degree, is in the top 15 in the country, just above Harvard’s. Dabo Swinney (in white shirt), Clemson’s head coach, points to the heavens before leading the Tigers onto the field. Mr. Swinney says many big-time football programs, particularly those in the South, allow students to explore their religious interests. But players and parents say Clemson’s emphasis is different. Tim Boyd, the father of Clemson’s starting quarterback, Tajh Boyd, says the religious priorities were clear from the start. On a visit to Mr. Swinney’s home, he noticed that the coach and his wife, Kathleen, made a point of not serving alcohol. And as the coach showed photos from his own playing days, he spoke about his beliefs, quoting Scripture and describing his foundation in the church. That focus won the Boyds over. Players and parents notice a focus on family here that they don’t see many other places. Every Wednesday is family night, when coaches and staff members bring their spouses and children to the team dinner. Players say that provides a positive model, especially for students who don’t come from two-parent homes. Mr. Swinney also encourages kids to hang around his team’s practices, a move designed to help keep coaches on their best behavior. Whenever a coach gets too worked up, the chaplain walks up behind him and tugs on his pants pocket. Values like that invite a certain kind of player. “It’s not to say they’re not recruiting anyone who’s not Christian, but people who are initially interested in Clemson are people whose faith and religion do matter to them,” says Cullen Harper, a former quarterback here. Rolitha Oglesby, the mother of Shaq Lawson, a freshman defensive end, has seen her son grow spiritually since he enrolled, in January. Growing up, he went to church with the family, but lately he has shown more and more interest in his faith. Soon after arriving, he let his mother know he needed a Bible for his room. In May, he posted a photo on Facebook revealing a striking new tattoo, with the words “Jesus Christ is my Savior” spread across his chest. 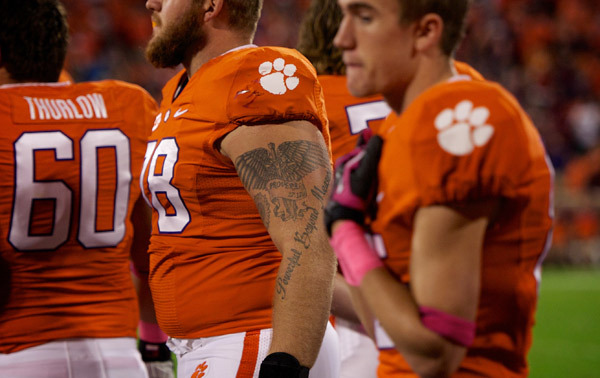 Clemson defensive end Shaq Lawson shows his tattoo that reads “Jesus Christ is my Savior,” October 19, 2013. Dozens of other players also display signs of faith. Many wear orange and purple wristbands inscribed with Bible verses, which one player’s parents bought for the whole team. Others have biblical references on their Twitter bios. “Don’t follow me, follow Jesus,” says the page of one Clemson recruit. Game days are awash in religious ritual. Players mark their faces with crosses, write inspirational messages on their wrist tape (“Blessed”), and kneel together in groups to pray. Players and coaches say the religious activities are often led by students. At least one night a week, players sit down for Bible studies together. Others are active in campus ministries. On Thursdays, a handful of team members attend a popular worship service featuring a local Christian rock band. Many weeks, 900 or more students show up. Mr. Swinney keeps religion in the top of players’ minds. He has a Bible on his desk and quotes from it frequently in team meetings. The good book, he says, is full of meaningful messages that can be applied to anyone. Players say that the words can have a persuasive effect. Some players who don’t share Mr. Swinney’s beliefs say they were not offended by his approach. Aaron Kelly, a former Clemson receiver who is a Jehovah’s Witness, says his coach was respectful of his religious choices. But sometimes he felt “a little left out” as he watched his teammates attend church together, gather for Bible studies, or have baptisms. He estimates that 10 to 15 receivers were baptized from 2004 to 2008, when he was there. During much of that time, Mr. Swinney was the receivers’ coach. Game days are awash in religious ritual. Players mark their faces with crosses, write inspirational messages on their wrist tape, and kneel together to pray. The solitude didn’t last long. From the opening drive until the final whistle, Mr. Swinney’s team was outplayed in nearly every aspect of the game, falling 51-14 to a powerful Seminoles squad. Afterward, Coach Swinney came into a quiet locker room and stood before his team. “This one’s on me,” he told them. Then, after a few words of encouragement, everyone joined hands to give thanks, according to several people who were there. Hours later, after his radio show was over, Coach Swinney walked through a mostly deserted locker room, stopping to talk with each of the dozen or so players who had hung around. He told Mr. Swinney how much he meant to the program, and how proud of him he was. Enter your email address to subscribe to SK Resource Library and receive notifications of new posts by email.